For great tasting popcorn, some long-time favorites such as Presto PopLite and the West Bend Stir Crazy Corn Popper stay tough to beat. And if you really want some nostalgia with your popcorn, look to Whirly Pop stove-top poppers. Want something more modern? Top microwave poppers are profiled, too. 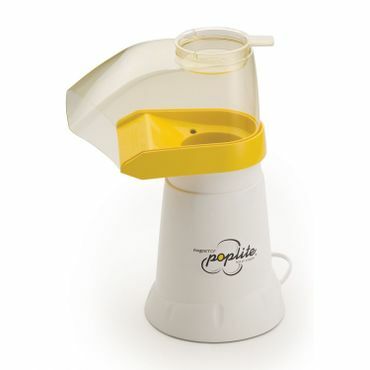 Professional testers and individual owners are won over by the Presto PopLite Hot Air Corn Popper's ability to make up to 18 cups of popcorn in a flash. This stand-alone popcorn popper uses hot air to pop kernels, allowing users to add their own seasonings after the popcorn is done. The machine, which is simple to use and easy to clean, attracts health-conscious owners, who are ecstatic about being able to make popcorn without oil. Though the West Bend Stir Crazy 6-Quart Electric Popcorn Popper requires a touch of oil, it uses a rotating arm to keep the kernels moving, resulting in evenly cooked, crispy popcorn. The built-in butter well makes getting great buttered popcorn easy, too. Owners say it pops nearly every kernel, and with its transparent lid that doubles as a popcorn bowl, you can watch this popcorn maker in action and have less cleanup when you're done. The Whirley-Pop Stovetop Popcorn Popper produces delectable popcorn on any stovetop with just a drop of oil and a bit of manpower. Crank the aluminum popper's handle to reap a 24-cup popcorn bounty in just three minutes. Because it works on the stovetop, you can create gourmet popcorn treats using flavorings like caramel that can't be used in other popcorn poppers. Owners say that the popper is fun to use and easy to clean. The Lékué Microwave Popcorn Popper makes up to 10 cups of popcorn in about three minutes, with a suction lid to prevent overflowing. Its compact design collapses to just two inches tall for easy storage, and the dishwasher-safe Lékué has measurement marks printed right on the bowl. It also doubles as a serving bowl, meaning there's only one dish to clean, and you can add flavorings right to the bowl before cooking. The simple Nordic Ware Microwave Popcorn Popper makes 12 cups of fluffy popcorn in about four minutes. No oil is required, so your snack stays healthy. 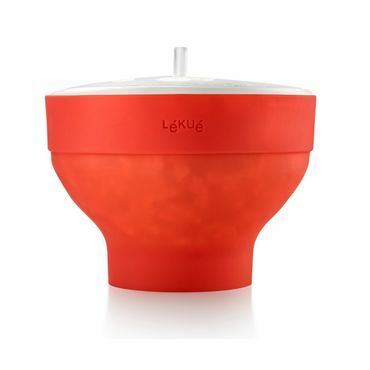 It lacks the convenient collapsible design that the Lékué boasts, and some complain that the bowl is piping hot when it's first removed from the microwave. However, most owners and experts are impressed and add that this BPA-free, easy-to-clean microwave popcorn popper is a terrific value. The typical American consumes about 43 quarts – or 172 cups – of popcorn each year. This buttery, salty treat has long been a movie theater and sports-stadium favorite, but you don't have to leave the comforts of your home to enjoy freshly popped corn. In fact, some people prefer to pop their own corn, as it's easier to control the amount of butter, salt, and oil used in preparation, all of which impacts the fat and other nutrition content. For $20 to $35, you can use a stand-alone, electric popcorn popper. Two options are available. Traditional popcorn poppers require a touch of oil to do their work, but produce a popcorn that's every bit as flavorful as what you will find at your favorite movie theater. Hot air poppers don't use any oil at all, and produce a light, airy, and somewhat healthier popcorn -- though most also have options to add butter or other flavorings. For those that want to make popcorn popping a more "interactive" experience, a manual stovetop popcorn popper is both effective and fun. These throwback poppers require hand cranking to keep kernels from sticking, but also can produce a lot of popcorn in a relatively short time. They are also ideal for those that want to experiment with different types of gourmet popcorn recipes, such as adding chocolate or other gooey ingredients. This type of popcorn popper is also relatively inexpensive; figure on spending around $30. Costing $10 to $20, microwave poppers offer the convenience of using the microwave to make popcorn without the additives found in microwavable bags. This type of popcorn maker is typically a plastic bowl with a vented lid that pops corn in your microwave within a few minutes. But even these poppers need to be closely monitored. A plus for some is that when you are not using it for making popcorn, the bowls can be used for other purposes. "The Best Popcorn Makers of 2016"
The best popcorn poppers are easy to use and include clear instructions. They are designed with vents to allow steam from the popping corn to escape to prevent the finished result from becoming mushy. The best poppers are also efficient and pop every kernel, without scorching, in just a few minutes. In addition, popcorn poppers shouldn't require much assembly and must be easy to clean. To identify the best popcorn poppers, we consulted hands-on tests conducted by editors at YourBestDigs.com, Cook's Illustrated magazine, Moo.Review, SurLaTable.com, and Heavy.com, as well as other reviews featuring one or more popcorn poppers from Leelalicious.com, TheKitchn.com and Cookistry.com. For opinions on real-world performance and usability, we turned to individual owner-written reviews on sites like Amazon.com, Walmart.com, and Target.com. While many people frown at getting an appliance that has just one purpose, many owners of stand-alone poppers are self-described popcorn fanatics who get plenty of use out of their units. Two options among stand-alone units rise to the top in reviews: the Presto PopLite Hot Air Corn Popper 04820 (Est. $25) -- also available as the Orville Redenbacher's Hot Air Popper 04821 (Est. $25) -- and the West Bend 82306 6 Qt. Stir Crazy Corn Popper (Est. $25). The Presto PopLite receives thousands of reviews at Amazon.com, earning high scores from most owners. Capable of making up to 18 cups of popcorn in about two and a half minutes, the Presto PopLite uses hot air – rather than oil – for a healthier snack. Popcorn lovers aren't limited to dry popcorn, though; a measuring cup built into the popper top will melt butter using the heat created during the popping process, so butter, oil, and other flavorings can be added as desired. That said, it's best to start with soft, room-temperature butter, because this popcorn popper works so quickly that cold butter often doesn't have enough time to melt. Many owners contributing reviews of the Presto PopLite on Amazon.com offer helpful tips for getting different results based on your personal taste and preferences. For instance, some owners suggest using particular brands of kernels or spraying olive oil or butter on the kernels with an olive oil sprayer for added flavor. However, some users say you need to work a little harder to evenly distribute seasonings since they cannot be added until the PopLite finishes popping. A few owners offer suggestions for overcoming this challenge, such as putting the finished popcorn in a bag with seasonings and shaking it up. The Presto PopLite is as durable as it is versatile, owners say. Many owners say they've owned this popcorn popper for years and it's held up with relatively consistent use – some for 10 years or more. While the machine pops nearly all kernels and never burns them, some piping hot ones often fly out in unsuspecting directions at start-up and at the end of the popping cycle, so you'll need a large bowl to capture all of the popcorn. Be forewarned: Half-popped kernels in the popping chamber will be very hot, so don't reach in after them. Reviewers do warn against adding popcorn kernels above the fill line, which can result in an overheating, smoking popcorn popper. Cleanup is simple; both the base and the plastic top can be wiped clean after use, and the plastic cover can also be removed and washed with soap and water. Editors at YourBestDigs.com do point out, however, that the Presto PopLite comes with a California Proposition 65 warning, as the plastic cover contains BPA. Both the Presto PopLite and its Orville Redenbacher-branded counterpart are backed by a one-year limited warranty. 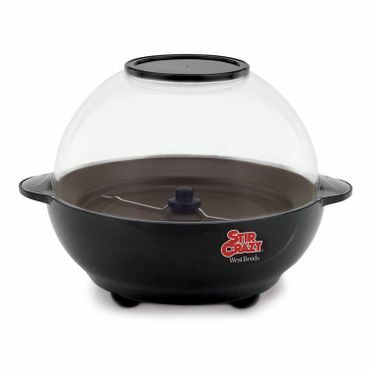 The West Bend Stir Crazy 6-Quart Electric Popcorn Popper also draws lots of consideration. Editors at YourBestDigs.com name it as their "most fun" pick in a roundup of five popcorn poppers, noting that it's also easy to use, made from quality materials, and lightweight at just four pounds. The West Bend Stir Crazy popper receives positive reviews from thousands of owners posting feedback to Amazon.com, earning average to high ratings from the majority. Users say this popcorn popper, which makes about six quarts of popcorn in about five minutes, makes great-tasting popcorn no matter what brand of popcorn kernels is used. Unlike the PopLite, which uses forced air, the West Bend Stir Crazy popper requires a little oil and has a rotating arm that turns slowly keeping the kernels moving to prevent them from sticking and burning. Users say the popcorn needs to be monitored, which is easy to do since the popper has a transparent lid. The lid contains an indented section with small holes that can be used to distribute melted butter onto the popcorn, and the lid doubles as a large popcorn bowl – but only when used with the cap to prevent any flavorings from leaking out of the holes. As soon as all of the kernels have popped, the unit needs to be unplugged so that it doesn't scorch your snack. Both the Presto PopLite and the West Bend Stir Crazy have some design issues. Some Presto PopLite owners say that the cover warps over time. The cover is made of a special material designed to absorb heat without melting, but, temperature does have an impact. Because of that, to retain the lid's shape, it needs to cool off on top of the base. Meanwhile, West Bend Stir Crazy users complain that their popper's rotating arm scrapes its nonstick base, and editors at Moo.Review say that kernels can get stuck under the arm and dragged along the hot base. When that happens -- which isn't every batch -- it results in the whole batch of popcorn having a "smokey" taste. If that's a concern, some owner reviews include a fix that may get rid of the issue. Neither popper has an on/off button -- a minor inconvenience for most. If the lack of an on/off switch is bothersome but you like the West Bend Stir Crazy's design, West Bend makes another version of its Stir Crazy popper, the West Bend Stir Crazy Popcorn Popper 82505 (Est. $25). 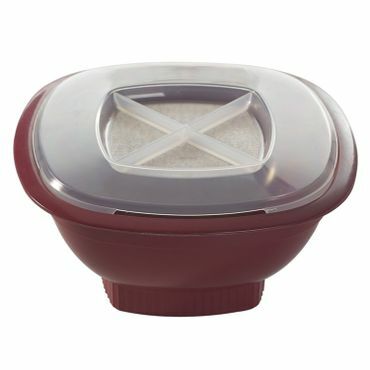 It pops up to 27 cups (about 6.75 quarts) in about four minutes, has an on/off switch, plus a convenient cord wrap and nesting design (the base fits nicely inside the lid) for easy storage. Like the West Bend 82306 6 Qt. Stir Crazy Corn Popper, its transparent lid doubles as a serving bowl and is BPA-free. If you are looking for another hot air option instead, the Cuisinart EasyPop Hot Air Popcorn Maker CPM-100 (Est. $35) is worth a look. Editors at SurLaTable.com say it's easy to use and maintain, and because it doesn't require oil, it's a good choice for popcorn lovers looking for healthier options. Like the PopLite, it has a butter tray for melting butter while you pop. However, editors say the popcorn was "kind of mushy." Leelalicious.com also praises the Cuisinart EasyPop, noting that all its removable parts are dishwasher-safe and BPA-free. Compared to other hot air poppers, the Cuisinart has a few things going for it: it has an on/off switch, as well as a convenient cord wrap for easy storage. Plus, it's quieter than most hot air poppers. However, it is a bit more expensive. The Cuisinart EasyPop earns high ratings from more than 1,500 owners posting feedback to Amazon.com. It comes in color options including red, white, and metallic red, and reviewers say it's a better-looking appliance and feels sturdier compared to the Presto PopLite. Users and professional testers agree that it tends to leave some kernels unpopped, and, like the PopLite, rogue kernels and popped corn can come flying out of the chute in all directions, requiring a large-diameter bowl to successfully capture it. The Cuisinart EasyPop pops up to 10 cups of popcorn in three minutes or less, although reviewers say the whole process takes about 10 minutes. In Moo.Review's test, it took an average of four minutes and 10 seconds to pop a full ½ cup of kernels. Reviewers say you need to keep an eye on this popcorn popper during use, as some popcorn can get stuck in the popping chamber and burn. Overall, though, if you use a popcorn popper frequently and don't mind a few unpopped kernels, the Cuisinart is an easy-to-use popper that's aesthetically pleasing enough to leave on your countertop, but also convenient to store. 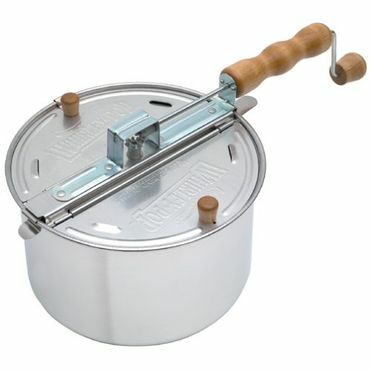 With its hand crank that continually stirs the popcorn, the Wabash Valley Farms Whirley-Pop Stovetop Popcorn Popper (Est. $30) is a stovetop popcorn maker that's reminiscent of the old days. But nostalgia isn't the only reason that owners flock to this popper. The Whirley Pop earns a high rating in thousands of owner-written reviews on Amazon.com, with most reviewers saying that it's fun to use, easy to clean, durable and works on any type of stovetop. The old-fashioned hand crank is patented and actually serves a purpose: keeping the kernels from sticking and burning for perfectly cooked popcorn. Owners also say that the popper is handy for large families with children who can't wait to dive into a big tub of popcorn. It makes about 24 cups in less than three minutes -- quicker than the West Bend Stir Crazy, which takes about five minutes to make the same amount. The popper also makes it easy to try recipes beyond the traditional movie-style popcorn, such as white chocolate almond popcorn. Experts say medium heat is all you need for quickly and evenly popping a batch of fresh, crisp popcorn. The clip-on lid is designed to stay put during use and has steam vents to keep the popcorn crisp and dry. Plus, the wooden hand crank stays cool during operation. Some reviewers at Amazon.com and other consumer review sites do criticize the Whirley Pop's manual operation, however, pointing out that manually turning the handle loses its novelty after a few uses. However, if you are looking to cut down on fats and don't like the taste of air-popped popcorn, the Whirley Pop is a good choice. Owners say it can make flavorful popcorn with as little as a teaspoon of oil. The Whirley Pop must be seasoned but doesn't require washing if you are using only oil; simply wiping it off with a paper towel or cloth will do the trick. But before you begin experimenting with gourmet popcorn recipes, keep in mind that a gooey recipe will require a more thorough hand-washing after the fact. It's not dishwasher-safe, and some owners say cleaning out the parts of the lid can be difficult. The Whirley Pop has a few other downsides. It's made of aluminum, disappointing users who have health concerns about cooking with this metal. The lightweight design is also prone to denting. In addition, it has plastic gears, which perturbs users when the pieces pop off. If all of that is a concern, the manufacturer has also released a stainless-steel version, the Wabash Valley Farms Whirley-Pop Stainless Steel Stovetop Popcorn Popper (Est. $50) with all metal gears. Still, its fans say that if handled with care, the original popper will last you years. If not, dig out its 25-year warranty, which covers the moving parts (gears) as well as the pan itself.